Streaming/royalty stocks have been darlings of the commodity investment world. In the precious metals sector, this type of company provides financing for mining companies in the form of an upfront cash payment in exchange for a percentage of production or revenues from the mine. Jason Hamlin of Gold Stock Bull profiles two streamers often overlooked by investors. The main difference between a streaming company and royalty company is that a royalty is cash paid as a percentage of revenue, while a stream involves the actual delivery of physical metal to the holder of the streaming agreement. The finance model has also been called a volumetric production payment transaction and originated in the oil and gas sector. 1) Diversification—A streaming company has agreements with multiple miners, thus spreading and mitigating any potential risk. The larger companies have dozens of deals and multiple income streams. 2) Unlimited Upside Potential—Since the deals they secure are usually for a percentage of the mine's production for life, the streaming company stands to benefit immensely if new zones are discovered and actual production comes in higher than originally forecasted. This occurs all of the time in the industry, as drilling delineates new resources, either increasing annual production or vastly extending the life of the mine. 3) Limited Downside Risk—While a miner may see profit margins squeezed as the cost of production rises, the streaming company typically has a contract for a percentage of the gold/silver production, thus eliminating the issue of rising costs. Royalties are paid out of top-line revenue before any operating expenses are accounted for. In addition, the contracts usually contain a number of provisions protecting the streaming company in the event of fraud, misrepresentation, etc. 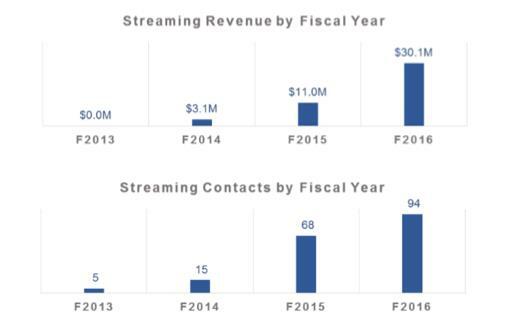 This is all on top of the considerable due diligence that is exercised before entering into any streaming deal. 4) Favorable Tax Treatment—Streamers enjoy a favorable tax situation courtesy of the Canadian government. As long as they reinvest their proceeds or pay it out as dividends, they are gifted with a tax rate in the neighborhood of 0–8%. That's a huge advantage when it comes to net profit margin. A few of the best-known streaming/royalty companies in the mining space are Franco-Nevada Corp. (FNV:TSX; FNV:NYSE), Silver Wheaton Corp. (SLW:TSX; SLW:NYSE) and Royal Gold Inc. (RGLD:NASDAQ; RGL:TSX). These stocks have all performed well during the 2016 bounce in commodity prices, offering leverage to the underlying move of the metals. For example, while gold and silver are up around 20% year to date, the three stocks mentioned above are up 45–55% in the same time period. But I believe the best returns in the streaming/royalty sector will come from junior streamers that have yet to be fully understood and appreciated by the market. One of my favorite among the small-cap streaming/royalty stocks is AuRico Metals Inc. (AMI:TSX). I first recommended the stock in September 2015 around $0.68, dubbing the company the "New Royalty Kid on the Block." The stock price is up 75% year to date in 2016, outpacing the gains of the larger and more popular streaming stocks. AuRico Metals was created in July 2015 as a spinout from the merger of AuRico Gold and Alamos Gold. The company was created to hold AuRico's Kemess project, a 1.5% net smelter return royalty (NSR) on the Young-Davidson mine, and AuRico's Fosterville and Stawell royalties. 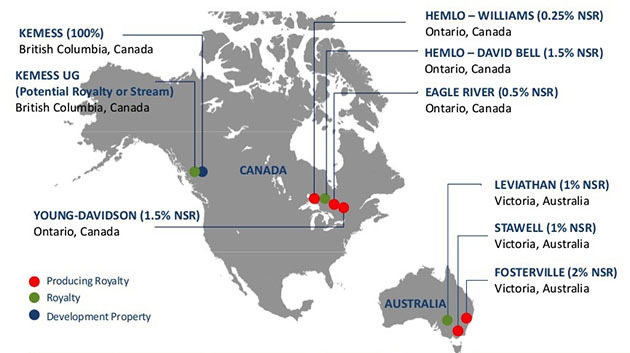 On Sept. 8, 2015, AuRico Metals announced the acquisition of Mineral Streams Inc., a private company owning a 0.25% NSR royalty on the Williams mine at Barrick Gold's Hemlo complex, a 0.5% NSR royalty on Wesdome Gold's Eagle River mine, and a 1.5% NSR royalty on Barrick's David Bell property, which also forms part of the Hemlo complex. The really exciting part of AuRico's portfolio to me has always been the upside potential of its partners' projects. Not only is its Young-Davidson royalty quickly ramping up production, but reserves have increased by double-digits at Fosterville, Hemlo, Eagle River and Stawell. The latest increase to reserves at Fosterville was 34% and AuRico Metals has exposure to this upside. The royalty projects are expected to generate annual revenue of roughly $7 million ($7M) at $1,150/ounce ($1,150/oz) gold. And they offer revenue growth potential well into the future, from both an increasing gold price and increasing production. Even with zero production growth, their revenues are projected to rocket nearly 50% higher to $10 million at $1,650/oz gold. Not to be overlooked is the fact that AuRico is not solely a royalty stock. The company also owns 100% of the Kemess underground gold-copper project in British Columbia, Canada. In March of this year AuRico announced a positive feasibility study with a base case after-tax NPV of CA$289M. This moves up to CA$421M with copper prices at $3.00 per pound. The study outlines the potential to produce 238,000 gold equivalent ounces per year at all-in sustaining costs of $682/oz over the first five years. So, we have a company generating $7M per year in royalty revenue and sitting on a project with an after-tax [email protected]% of around CA$300M, yet its market cap is under CA$150M. And to add to the upside potential, this company is a likely takeover target for a larger streaming/royalty company. This stock has been in the Gold Stock Bull model portfolio since September of last year and is up over 55% since it was placed on the list. The stock is up significantly in 2016 and recently reached overbought levels. I would be inclined to wait for a dip below CA$0.95. 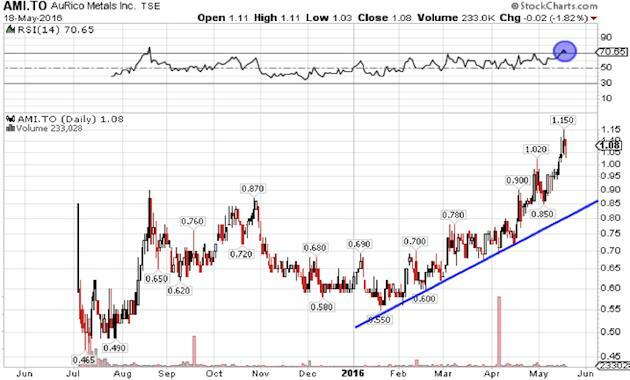 But short-term sentiment aside, I think AuRico Metals has a strong future and will continue to outperform its peers. 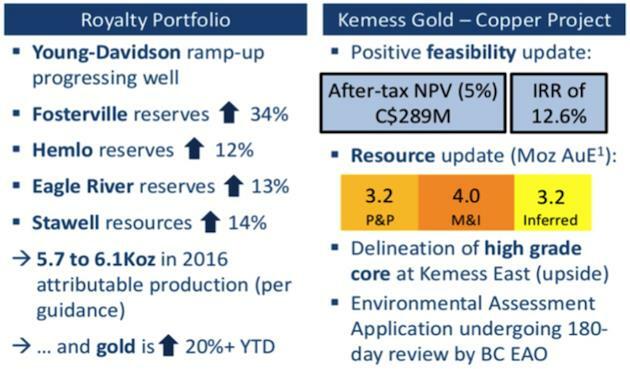 The company has a diversified portfolio of royalties and can use these revenues to develop its low-risk, low-cost project at Kemess with minimal shareholder dilution. The first company to apply this successful business model to agriculture is Input Capital Corp. (INP:TSX.V). The company flies under the radar of most investors, but I think it will generate outsized returns over the next few years. Input Capital enters into canola streaming contracts with canola farmers in Western Canada. Pursuant to the streaming contract, Input purchases a fixed portion of the canola produced, at a fixed price, for the duration of the term of the contract. Input is a non-operating farming company with a portfolio of over 100 canola streams, all of which produce canola and revenue for Input in the year the agreement is signed. Over the last four years, Input has invested $123.1M via streaming contracts to strengthen farm balance sheets and enable improved crop production. The company is focused on farmers with quality production profiles, excellent upside yield potential, and strong management teams. During the most recent quarter, Input signed 38 canola streaming contracts for total up-front payments of $11M. Year-over-year, Input's streaming revenue has increased by 173% on an increase in canola streaming volume of 160%. The company has zero debt and uses existing cash on the balance sheet along with cash flow from operations to fuel its rapid growth. I like buying companies where insiders have skin in the game and the interests of management are aligned with the interest of all shareholders. Insiders own over 20% of the company and have a stated focus on strong returns resulting in robust compounding of capital. Speaking of management, Input Capital has a track record of building and profitably exiting deals in the Canadian agriculture sector. It launched the first farmland private equity fund in Canada in 2005 and raised $53M in equity. In January 2014, it closed the sale of a 115,000 acre portfolio of Saskatchewan farmland to the Canada Pension Plan Investment Board (CPPIB) for $128M. I believe that Input Capital is undervalued and is currently offering an attractive entry point. This is due to the announcement of three these canceled contracts in November of last year that caused the share price to drop nearly 50%. Investor panicked out of their positions and I believe they over-reacted. On May 11, Input Capital announced that management expects via auctions and land sales to completely recover all of the capital associated with the largest streaming contract that was canceled. In fact, it expects to fully recover all of the capital associated with all three terminated contracts. I believe that the share price should return to previous levels following these announcements. This implies upside of at least 50%. But considering how fast the company is growing its streaming portfolio and revenues, the upside potential is likely much higher. Portfolio and counter-party risk continues to be reduced as a result of improved process and underwriting procedures during due diligence and by significantly reducing the average streaming contract size. Another bullish development for Input is rising canola prices. After price declines across the board over the past several years, food prices appear to have bottomed and have started to head higher in 2016. 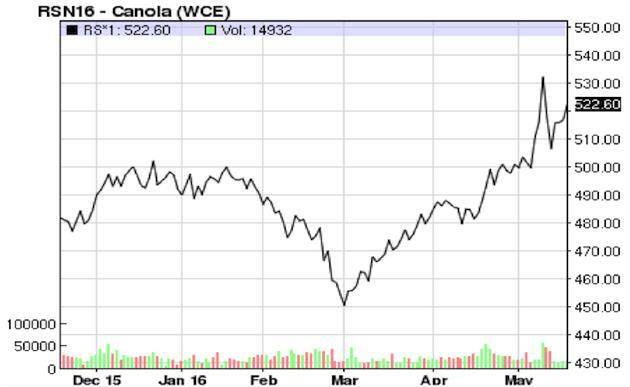 The following chart shows the strong rebound in canola prices over the past few months. While prices can be very volatile, I expect a continuation of this upward trend throughout 2016 and into 2017. The technical chart for Input Capital shows the upward trajectory that was in place since 2013 and the steep gap downwards that occurred in November of 2015. The price continued to slide to a low of $1.50, but has bounced back towards $2.00 in the last week. The RSI became overbought, but I think the upside potential remains enormous and I have a target price of $4.00. At minimum, I think the share price should recover toward the previous trend line and bring the price to around $3.60. 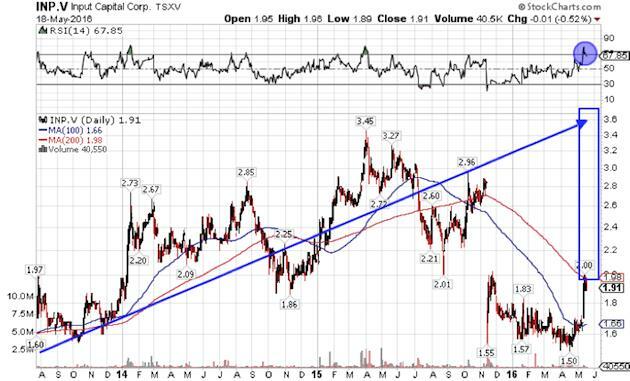 But considering recent growth in its portfolio, higher canola prices and strong financials, I expect the share price to climb to at least $4.00 over the next 12–18 months. This represents upside of greater than 100% from the current price! Input Capital will release fiscal Q4/16 and year-end results after market close on Tuesday, May 31, 2016. I expect strong results that will help to propel the price higher. We already have a long position in the Gold Stock Bull model portfolio, but may look to add to the position prior to the release of these financials. The default on 3 streams was clearly a negative but the sell-off has been substantially overdone. Input remains a strong buy during the dip with a long-term view. Click here to subscribe to Jason Hamlin's Contrarian Gold Report newsletter. Jason Hamlin is the founder of Gold Stock Bull (www.goldstockbull.com) and publishes one of the most highly-rated investment newsletters available, focused on strategies for profiting on the bull markets in gold, silver, energy, rare earth metals and agriculture. Mr. Hamlin has a background analyzing charts and trends for the world's largest market research company, is versed in fundamental and technical analysis and has consulted to Fortune 500 companies around the globe. 1) The following companies mentioned in the article are sponsors of Streetwise Reports: Silver Wheaton Corp. The companies mentioned in this article were not involved in any aspect of the article preparation so the expert could speak independently about the sector. Streetwise Reports does not accept stock in exchange for its services. The information provided above is for informational purposes only and is not a recommendation to buy or sell any security. 3) Jason Hamlin: I or my family own shares of the following companies mentioned in this article: None, but may establish a position in the coming days. I personally am or my family is paid by the following companies mentioned in this article: None. My company has a financial relationship with the following companies mentioned in this article: None. I determined which companies would be included in this article based on my research and understanding of the sector. Statement and opinions expressed are the opinions of Jason Hamlin and not of Streetwise Reports or its officers. Jason Hamlin is wholly responsible for the validity of the statements. Jason Hamlin was not paid by Streetwise Reports for this article. Streetwise Reports was not paid by the author to publish or syndicate this article.